DisplayLink technology easily up to 1920 x 1080 video graphics displays GPU Performance & Resolution. Allows for effortless multitasking, mirror or extend a computer display workspace, simple to install and use. Add or remove devices without system reboot, ease to install, plug-and-Play, hot pluggable support. Support rotation to portrait mode for full-page editing. Allows for effortless multitasking, mirror or extend a computer display works pace, simple to install and use. 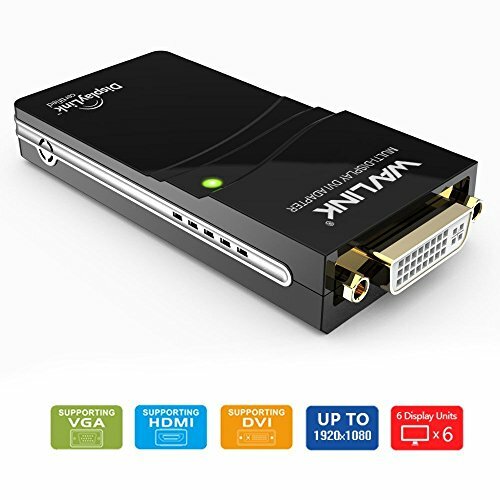 1x VGA adapter, HDMI adapter, USB2.0 cable, quick start guide, CD driver (Driver can be download also, please timely to download the latest driver). 12 months worry-free warranty.